NorthJersey.com reports that Julie Paporello dedicated her Girl Scout Gold Award project to supplying financially disadvantaged girls with Holy Communion dresses. While observing her younger brother receive his first Communion, it dawned on her that some youngsters probably could not afford such finery. What did not dawn on Julie, a parishioner at Our Lady of the Magnificat R.C. Church in Kinnelon, was the poignant story that was revealed to her anonymously by a mom, who was one of the first to donate a dress and all its angelic accessories. The painful memories revealed by this mother prompted Julie to name her project, "Faith and Friends – A White Dress for Tara." When Julie decided to collect the dresses she placed her request for white first Communion dresses in the Our Lady of the Magnificat church bulletin and in the bulletins of Catholic churches in the surrounding areas. One of the first to arrive came in a white bag that also contained a Bible, white veil with a tiara, a Communion memories book, rosary beads, and socks. Julie was able to collect roughly 125 first Communion dresses – about half of them new and the other half probably only worn on First Communion Day. Clyde's Cleaners in Denville dry-cleaned all the pre-owned dresses free of charge. Besides local families, the business community took the project to heart and was very generous. 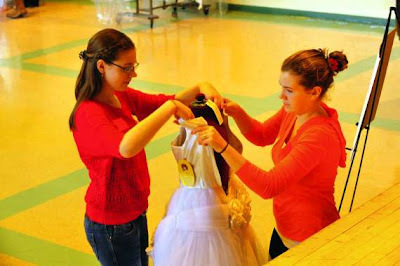 Cinderella's Closet of Pompton Lakes, Faith and Begorra of Denville, and J.C. Penney each donated several dresses. The Gold Award is Girl Scouting's highest achievement. To earn a Gold Award, a Girl Scout must obtain a leadership award that requires 35 hours of work, a career exploration award, and completion of a 65-hour service project. Only 12 percent of Scouts in northern New Jersey earn a Gold Award. Julie is a graduate of OLM School in Kinnelon and is currently a senior at Mountain Lakes High School.